Anyone who might bump in to me over the next few days should be careful not to fall in to the huge gaping void in my face, that was once my mouth. Seriously - I have a beam on my face the size of Manhattan at the moment! 10.30am: Read article for third time. 10.38am: Wonder how to actually spell Damian Hurst Damien Hirst? 10.43am: Abruptly forced to return to real world as phone rings at work. How inconvenient - a customer! It means so much to me that other bear lovers like my paintings and it is such a beautiful magazine to be featured in. You'd think I'd be bored of bears by now - but actually I am quite the opposite. I have a further series of bears in mind once these eight are complete. Bear six is well under way now. The under-painting is finished and I've started on the background. Are any of you as messy as I am...? I swear there is as much paint on my clothes as there is on the canvas! Duh! Is that an apron hanging up behind me?? Congrats Sandra, that double page spread looks fabulous! Love the post too and chuckled throughout. Congrats again this is wonderful! Sandra, Congratulations on the article. !! You've done it! and you deserve it! Your work is amazing. Thank you very much Prabal! I know you'll be thrilled to pieces! Oh Sandra!!! Congratulations!!!! I would have done the same thing as your Mom...how incredibly proud she is...I am so thrilled for you!!!! I could definitely see the chewed up bear in a future painting!! No wonder you're smile is splitting your face - I would be the same. 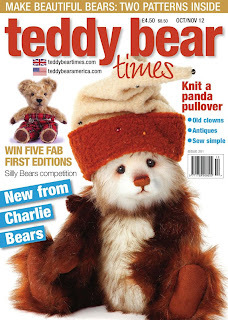 You must be delighted - who knew there was a magazine dedicated to bears (although from watching 'have I got news for you', I really shouldn't be surprised as there seems to be a magazine about every subject under the sun!) However, if you ever dare sit anywhere near Hirst I'll have to have serious words with you - he isn't fit to lick the paint of your messy sweatshirt! Hehe! I was wondering what you would have to say about that, lol! Lucky magazine I say! Every self-respecting Teddy Bear publication should be fighting to do an article about you amazing paintings. Love the painted clothes you are wearing too - it's all part of a true artists equipment! Thanks so much Jerry! Lovely to see you back! Sandra! How exciting! Congratulations on the big spread and numerous photos and the interview! Wow - you have hit the big time! Your teddy bear paintings are so charming and each one tells an intricate story - your success is very much deserved! Congratulations Sandra! That's an awesome long (!) article. Congratulations Sandra! It must be a great satisfaction to see your pictures in a magazine. An acknowledgment of your art and your mastery. I'm happy for you. Hugs! 8.17am having scraped myself out of bed after a night in London, I am reading your blog and I've got to wait until Monday to read the article!! My Sister in a magazine article that big! Well I wont have any trouble with my autographed copy will I. Many congratulations, Sandra, on your well-deserved fame! Enjoy - We all know how hard you have worked for this! There are good days....and then ...there are GOOD days!!! Well done, Sandra, I told you that you were going to be famous didn't I? Great buzz for you, enjoy it, you worked hard enough for it. Will you be live broadcasting on the TBC? Toutes mes félicitations pour cet article dans cette revue. Vous pouvez être fière mais sincèrement votre travail mérite cet honneur. Toutes mes félicitations. Un grand merci aussi pour votre aimable commentaire. Après de si longues semaines d'absence je me réjouis de vous retrouver et de vous lire. je vous fais de gros bisous et vous à très bientôt. Congratulations on the article in the magazine! Your work is very good and you have an exemplary dedication. Deserves the honor! Hello Sandra:) First of all: congratulations with your article. Almost famous!! I'm a great teddybear lover my self. I love your art and keep following you:) The way you write, with a lot of humor, I like so much. The half eaten teddy is so cute. Love it en love your blog! Thank you so much for visiting and for leaving such a lovely comment! CONGRATULATIONS Sandra !!! ....wish i could read the article . Hi Jane - Thank you! If only I could get it a little clearer! So frustrating! Wowee!!! How great is that?? Congratulations Sandra. Having followed your growth for a while now I have to say that a day like this always seemed fairly inevitable. Loved your post which made me laugh. Well done you!!! Oh wow I bet you are still smiling now. I know I would be. Congrats onthe painting and the article. Your post just made me laugh :). The article looks just wonderful, congratulations! You must be so excited. I'll have to see if I'll manage to read it on my huge monitor at work, or else see if I can get a copy somewhere. I'm so glad that your work is so appreciated. I really love your teddy bears, and that old poor teddy in the photo is just adorable. Are you going to paint him too? You are so much tidier than I would ever or even could ever be even if I tried. I have paint everywhere and it is thick on my easel. I do not think I own a piece of clothing that does not have paint on it. Messy?? you? Never! !